IS SELF-PUBLISHING RIGHT FOR EVERYBODY? The book publishing world has gone through a revolution in recent years that is similar to the one that happened in music ten years ago when it became easy for bands to publish their own music and have their fans download it, instead of dealing with the middlemen – the record companies. With the rise of e-books it’s easy for authors to self-publish, rather than go through the laborious process of trying to get a book contract with a mainstream publisher. But is it worth it? There are many pros and cons to self-publishing, and if you’re thinking of doing it, these are the questions you should ask. How long am I willing to wait to get published? If you have a story or idea that is just gnawing at you and you feel compelled to publish it, you’ll definitely get it into your readers’ hands a lot quicker if you self-publish. The traditional publishing route can take years, from the time when you send out your first manuscript to when the book actually gets on the market. If you self-publish an e-book it will be a matter of months from the time you write it to when you can publish it. Am I willing to promote and market my book, or do I want somebody else to do that? Traditional publishers do a lot of the marketing for their books, which takes pressure off the authors. If you self-publish, the marketing begins and ends with you. Do I want to do all the editing, cover design, formatting, etc. myself, or do I want somebody else to do that? Again, traditional publishers have the manpower to do the jobs involved in the book’s presentation. 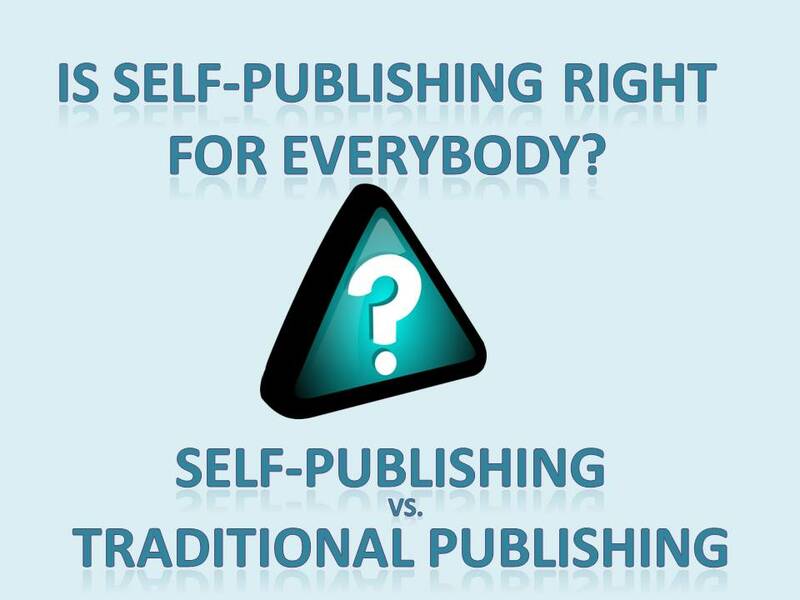 If you self-publish, you’re responsible for all that. How much of a royalty do I want? Self-publishers get to keep up to 70 percent of their book’s income. The royalty offered by publishers is usually in the single digits. Self-publishing is a viable option for some authors, but for others, it’s not as attractive as going the traditional publishing route. It’s a question you need to research and think about, to determine if it’s right for you.